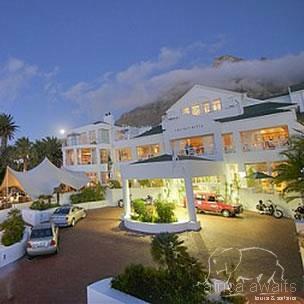 Built in 1989 and perfectly positioned between the majestic backdrop of the Twelve Apostles and the white sands of Camps Bay Beach, The Bay was the first beachfront hotel in Cape Town - a status that it still holds today. Elegantly nestled in the majestic shadow of table Mountain and gazing upon one of the world’s most beautiful beaches, you will find The Bay Hotel. Perfectly positioned between the majestic backdrop of the Twelve Apostles and the white sands of Camps Bay Beach, The Bay was the first beachfront hotel in Cape Town, a status that it still holds today. Introducing a management style based on friendly relaxed charm and personal service, The Bay has proven over the years that 5 star elegance and sophistication can be achieved in an informal atmosphere. Boutique-style personal service combined with friendly relaxed charm compliments the sophistication and elegance of The Bay Hotel. 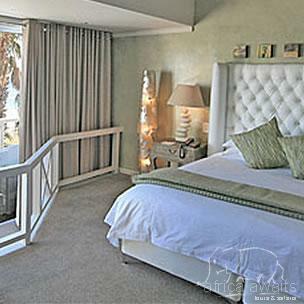 Every one of the 72 bedrooms and 6 suites gaze upon the spectacular vista that is Camps Bay. Most rooms have spacious balconies and all have a private entrance lobby, en-suite bathroom with separate shower, mini bar, tea & coffee making facilities & built-in electronic safes. Rooms are fitted with either twin or king size beds. The Penthouse is directly sea facing with it’s own balcony, marble staircase, entrance lobby, separate dining room & lounge, bedroom, dressing room, en-suite bathroom with separate shower and a large oval bath – a total of 160 square metres. 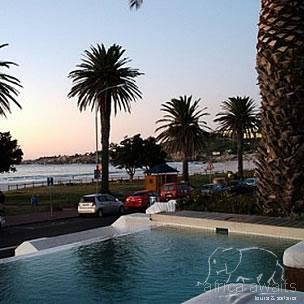 With your holiday, safari or business trip from in to The Bay Hotel in Cape Town.